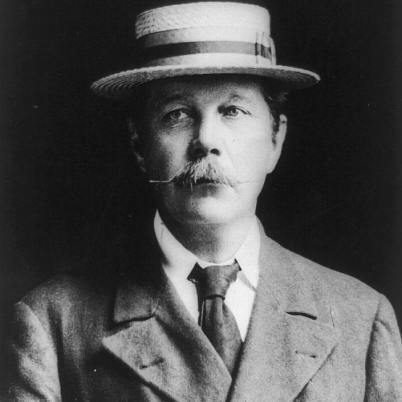 Doyle (1859-1930) is of course best known for being the creator of Sherlock Holmes and Dr Watson, but he also wrote a good deal of fantasy (especially supernatural and horror fantasy) and some science fiction. He was born in Edinburgh, and went to Catholic schools: Stonyhurst College in England and a Jesuit college in Austria. He trained as a doctor in Edinburgh, and in 1881 served as medic on board a Greenland whaler and a ship bound for West Africa. Thereafter he practiced in various towns in England before settling in London and, briefly, specialising in opthalmology. Throughout the period of his medical training he was writing stories, and in 1886 his first Holmes story (the novel A Study in Scarlet ) was published. In 1893 Holmes and Moriarty fell to their deaths, allowing Doyle to concentrate on writing that he considered more important, but in 1901 he was persuaded to publish a novel about the pre-1893 career of Holmes (The Hound of the Baskervilles) and in 1903 revealed that Holmes had not died after all. His fantasy output relates to some extent to his beliefs: he attended seances from the age of twenty, and joined the Society for Psychical Research in 1893, and later converted to spiritualism. He is famous for being fooled by the faked fairy photographs of two girls in Cottingley; he was also convinced that Harry Houdini (a well-known sceptic) performed his escapist feats by using magic. One early novel, The Mystery of Cloomber, published only when he became well known, is about a retired general from the Indian Army who encounters Indian magic. His numerous non-Holmes short stories were frequently fantastical, and occasionally science-fictional: some of the best are “The Horror of the Heights”, “The Leather Funnel”, “The Terror of Blue John Gap”, “The Great Keinplatz Experiment”, and “The Los Amigos Fiasco”. The only science fiction novels he wrote featured the colourful character of Professor Challenger. The Lost World (1912) and The Poison Belt (1913) are pure science fiction; in The Land of Mist (1926) the rational professor is persuaded to become a spiritualist, while the last two Challenger stories feature Atlantis. Doyle stood for parliament twice (unsuccessfully), and won the gratitude of the government during the Boer War for publicising the justice of the British position. He even served briefly as a volunteer doctor in Bloemfontein in 1900. He was knighted in 1902, and appointed Deputy Lieutenant of Surrey. In 1916, bizarrely, he visited the Western Front in a military uniform he had designed for himself as Deputy Lieutenant: see here for a full account of his experiences in the War.